January’s Shift your life challenge qualifying winner is BMM’s 2015 Bikini Model Champ Keli Park. She is back with new goals as well as doing what she has always done, inspired the whole BMM Fit Fam and many many fans. Keli has been maintaining her physique as long as she has been with us and has always had an athletic background which you will hear about in her interview below. It just goes to show that if you keep working hard and make fitness a lifestyle you too can overcome obstacles. Although Keli makes it look easy she has had anything but an easy go where her health is concerned. 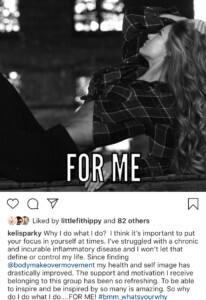 Keli suffers from colitis an autoimmune disease that can make any goal setting a real challenge. For Keli though, her determination and consistency are what makes her so inspirational. She brings a grounding to the group and helps us all remember to keep at it even if things get tough. When did you first get involved with an exercise routine? I’ve always been surrounded by people who worked out and wanted to stay healthy and influenced me to do the same. However, it wasn’t until I got involved with The Body Makeover Movement that helped me get motivated to take it to the next level. Witnessing others set goals and achieve them inspires me. It’s so amazing to watch other’s transformations. I also get inspired by motivating others to want to get into shape. What is one piece of advice that you would give someone that has been working out for a while but not seeing the results they are hoping for? As they say, Rome wasn’t built in a year…be consistent and switch things up. Never give up! Hearing how I have motivated others and seeing changes in myself physically and mentally keeps me moving forward. I struggle with the same issues as most people do when working out…not seeing changes immediately and being too hard on myself. You have struggled with health issues over the years, is there anything good that has come from this? It has shown me that I am stronger than I give myself credit for. It proves that anything you put your mind to you can overcome many of those obstacles. What are some goals you are working on now? To be more patient and kind to my body and mind. Our world is so filled with negativity that my goal is to be more positive. One day though I wouldn’t mind hitting the stage. It has always been something I’ve wanted to do. I don’t even care if I place, I just want to say I did it! Growing up watching my dad workout in the garage with his buddies while they blasted 80’s music. I thought he was Superman and I loved how he made me want to workout and be strong too.